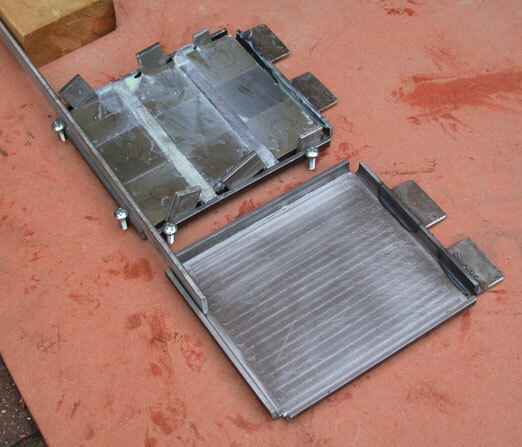 The corner armour plates are 4 mm stainless steel. I hadn't taken account of the strength of the arena floor. 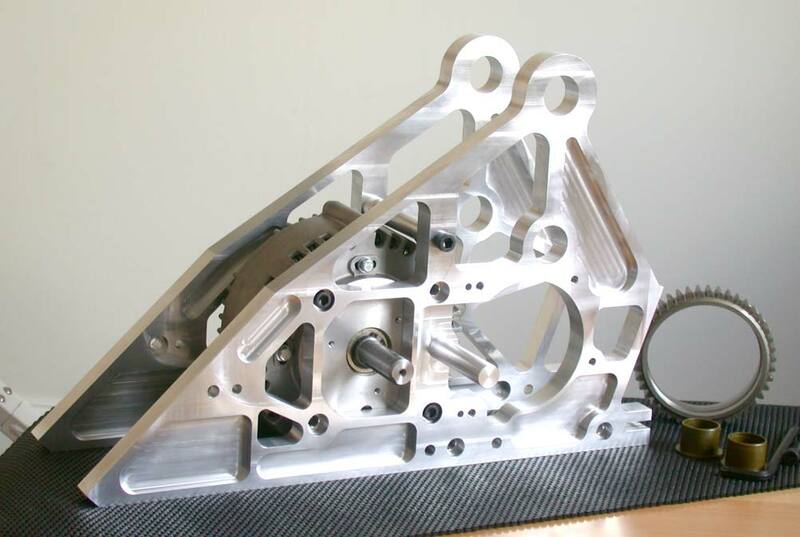 It is constructed from two sheets of 1/8" steel, 4 x 4 ft in size, seam welded around the edges to a steel frame. 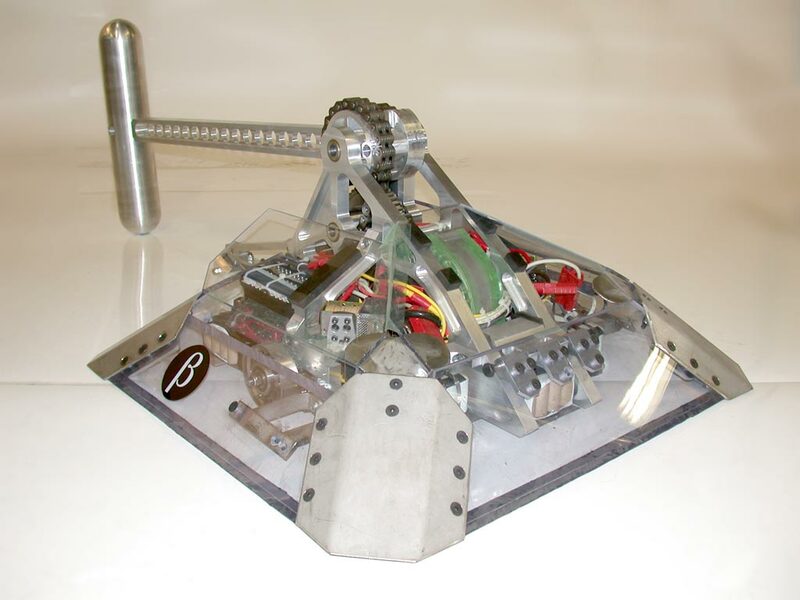 Because the magnets built into the base of beta pull around 400 kg (900 lbs), as soon as we lowered beta on the floor of the test arena, the magnets pulled the floor up, eliminating the 4mm gap between them and locking beta onto the floor making it impossible to move under its own power. We tried increasing the gap between the magnets and the floor and adding bearings beside the magnets to keep the floor away, but without much success - the floor still managed to flex sufficiently to contact the magnets. We couldn't increase the gap much more or reduce the magnetic force significantly because, due to the power of the hammer, it needs to be clamped firmly to the floor when firing. See the video below. So a bit of a redesign is called for. It looks like electromagnets will be the way to go, with them only being energised just before we fire. 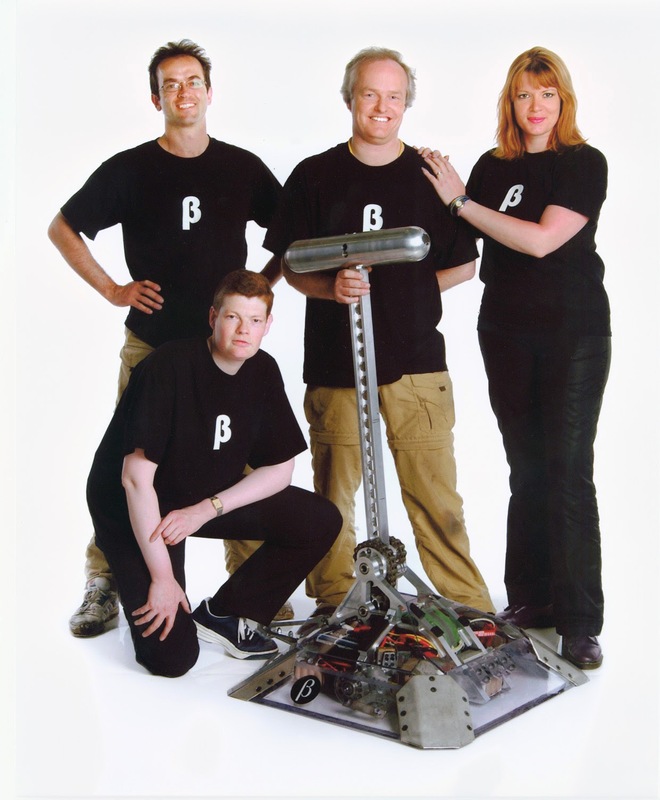 At least we now have plenty of time to get it ready and tested for the next BattleBots. 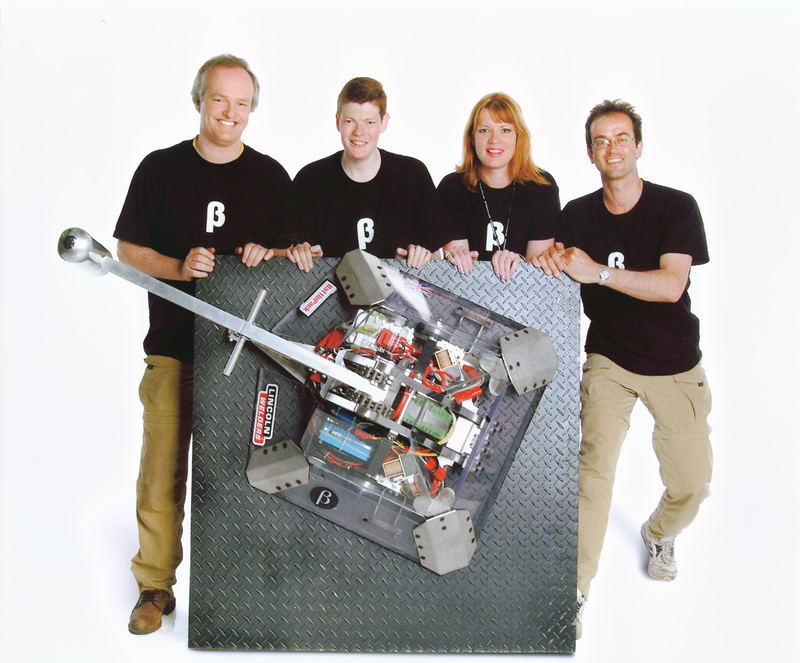 The magnets holding the 100 kg of beta + the 80 kg of Dominic. 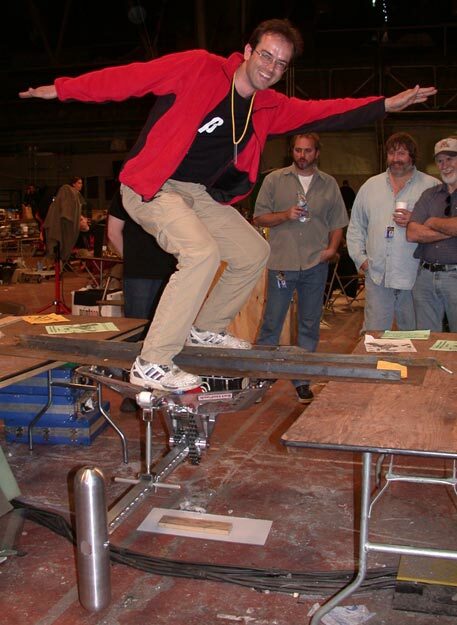 Holding onto a piece of 1/8" steel sheet. 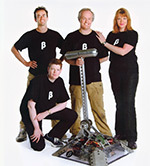 Video of us trying out the hammer in the BattleBots test arena. The dissapointment of not getting beta to run was made up for by how well the weapon performed. Many thanks to Dominic, George Francis and Gillie Blood for all their help. Right click here and select Save Target As... to save the video. 1.1 MB. Quicktime 5 required. The snail cams that drive the hammer. 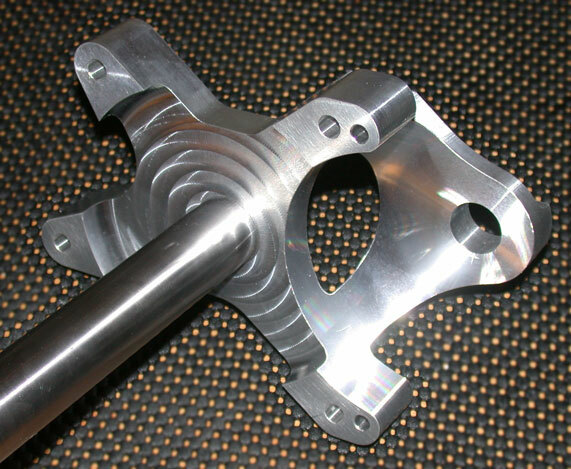 The cams are machined from EN24T steel and the ring gear is case hardened EN36. The cams start off at a small radius, giving maximum torque to the hammer and allowing the motor to get up to operating speed. The radius increases as the hammer swings round, keeping the motor turning over at the speed at which it produces maximum power. The cams are shrink fitted with Loctite into the final (3 module) gear of the gearbox. 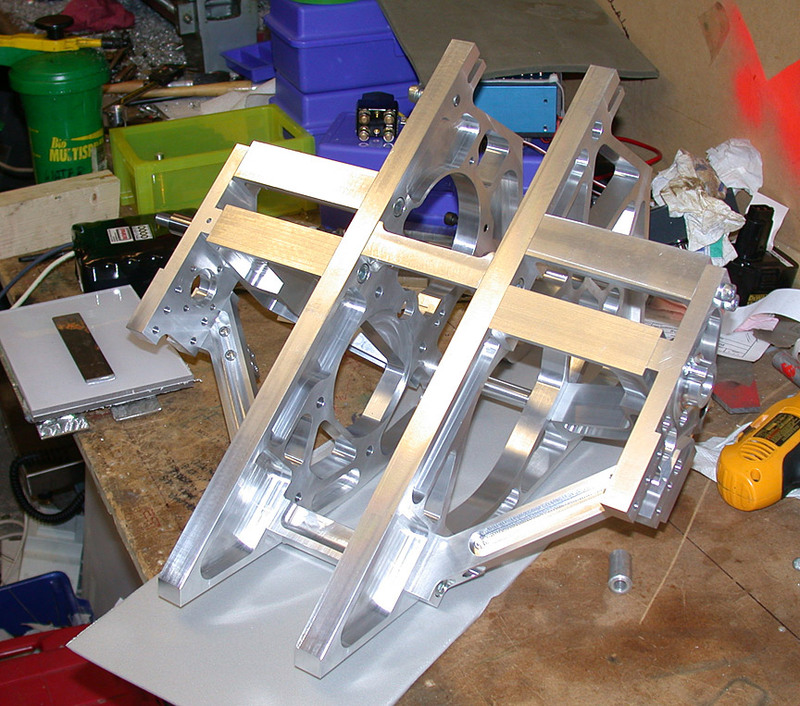 The assembly weighs just over 3kg - heavy, but it has to be able to handle the 6 tonnes of tension in the leaf chains. The snail cam on one side is used to fire the hammer and the one on the other side is used for retracting. Many thanks to Arthur and Rob of Mortis for this idea. The chain drums bolted onto the hammer shaft. The active portion of these is of a constant radius. The Snails cams are connected to the drums with leaf chain, as used in fork-lift trucks. 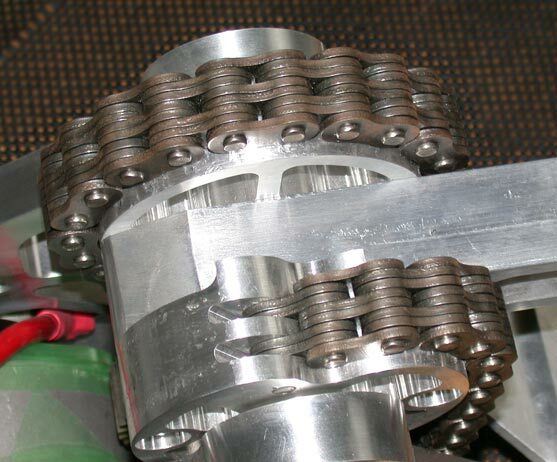 The chain is 0.75" pitch with 4x4 plates. Safe working load of 13 tonnes force. You can't use leaf chain with a sprocket as there is no space for the teeth - you have to anchor it at each end. 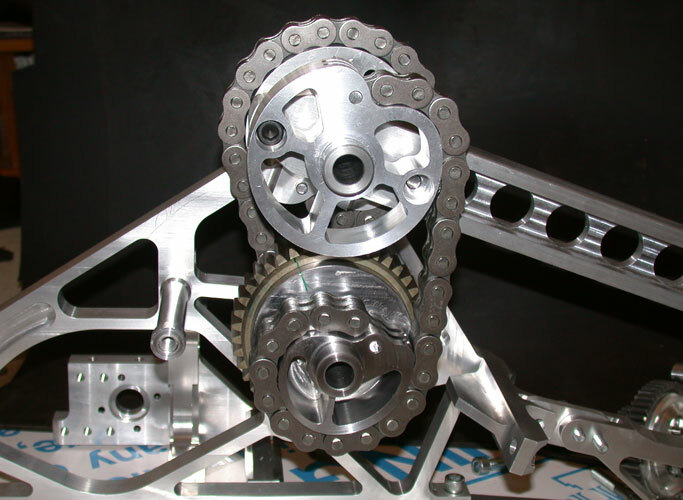 Because it uses 4 plates instead of two, it has twice the strength of a normal roller chain of the same pitch. The pins in the chain are 5/16" diameter, or about 7.94 mm. Because bolts are made undersize, an M8 bolt is a very nice fit in a 7/16 hole, so we cut down some 12.9 grade M8 cap head bolts for the retaining pins - a cheap and readily available source of 5/16" tough, high tensile pins. The drums and snail cams fitted into the chassis with the leaf chains. The nearest chain is the one used for retracting the hammer. Shown fully retracted. 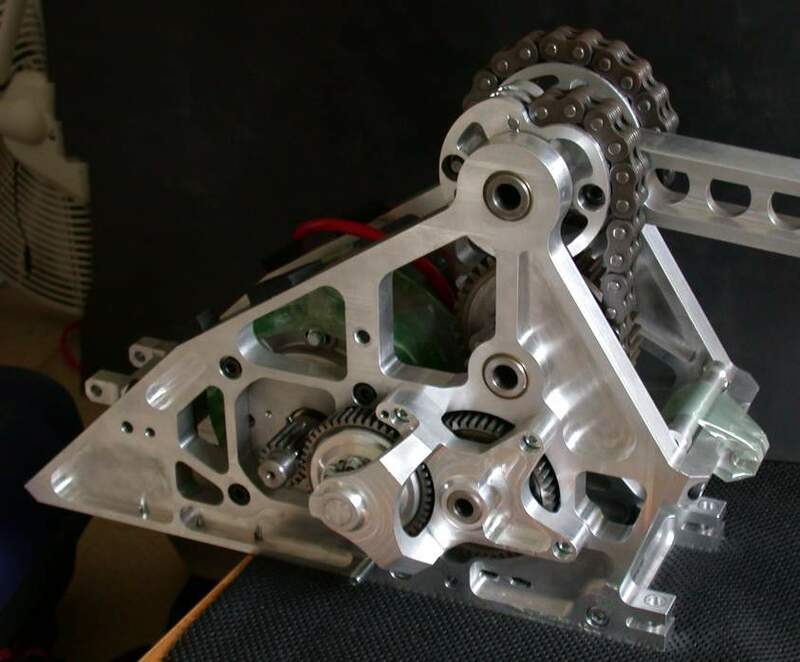 The completed drivetrain for the weapon. The shaft about which the hammer rotates and the similar shaft vertically below it, rotate in igus iglidur polymer bearings. They weigh nothing and can take loads of around 6 tonnes, at low speed. The other gears run on needle roller bearings on fixed shafts. The gearcase and shaft that bolts to the side of one of the main chassis members. 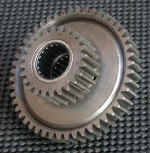 The clutch and final gear pair fitted onto the gearcase. 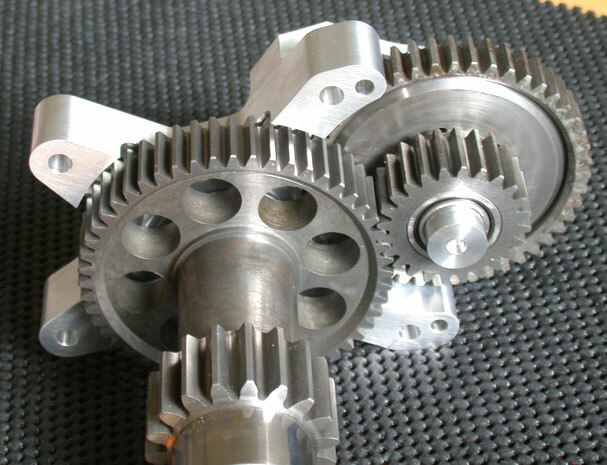 The closest gear engages with the gear between the two snail cams and the rightmost gear engages with the pinion on the weapon motor. 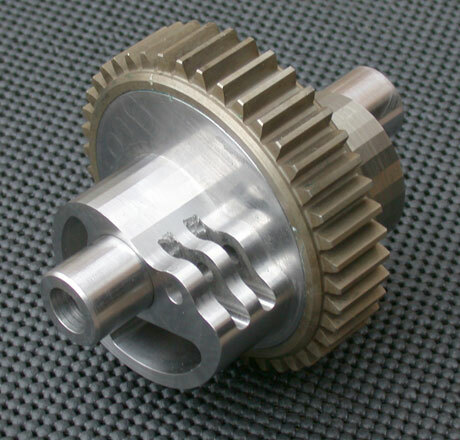 The overall gear ratio from the motor to the hammer shaft varies from 34:1 to 18:1, depending on the position of the snail cam. 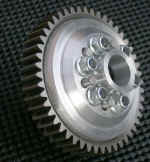 Both gear pairs are fitted with needle roller bearings. One the left pair, the needles run directly on the EN24T shaft. The parts of the friction clutch that protects the Briggs and Stratton Etek weapon motor from shock torques. 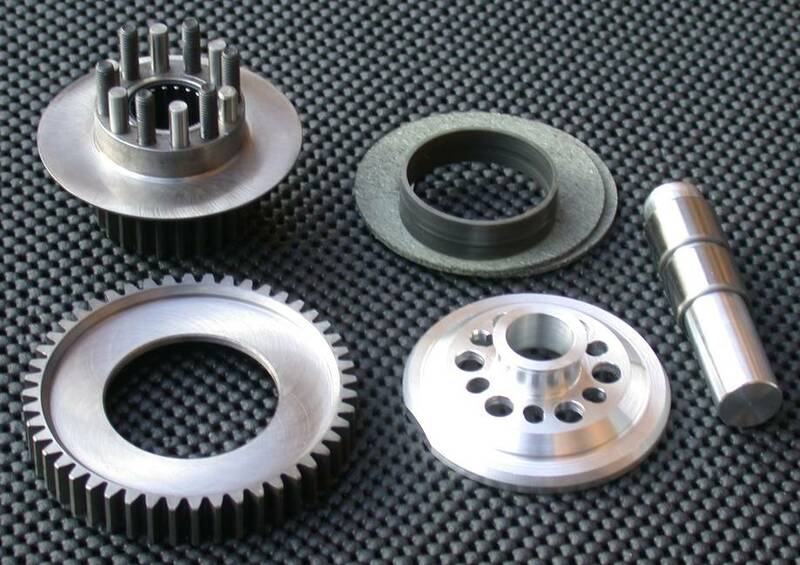 � Output gear and pressure plate, with studs and dowels to connect to ally pressure plate. 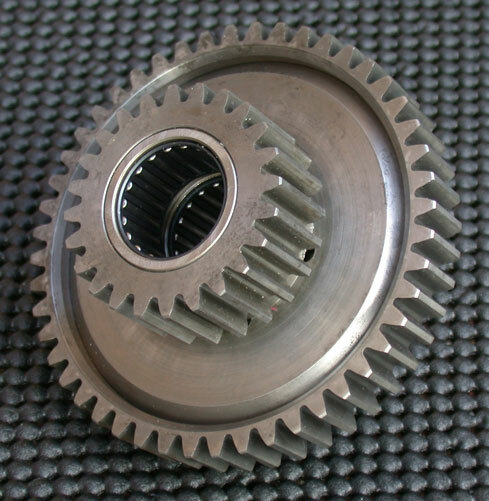 � The two Discs of friction material and nylatron bearing to support input gear. 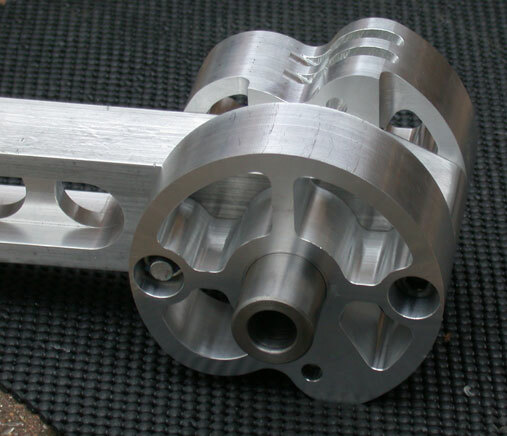 � Ally shaft with inner rings of needle roller bearings bonded in place. � Input gear with friction surfaces. Front face of the clutch showing the nuts used to adjust the slipping torque, which we set to just above the stall torque of the motor. Rear face of the clutch showing the needle roller bearings pressed in place. Building up the trays of magnets. A three man job! Nine Neodymium-Iron-Boron permanent magnets per tray. Each magnet is 50 x 50 x 12.5 mm and can hold around 200 kg when touching a thick piece of steel. One tray is fitted to each side of the base of the machine.